It is now the beginning of summer. You've planted your pollinator-friendly garden and participated in National Planning Week. Now what? As a teacher and a lifelong learner, I believe it is important to educate ourselves and our children on the role of pollinators in Canada's ecosystem and the ways in which we can help them continue to thrive. 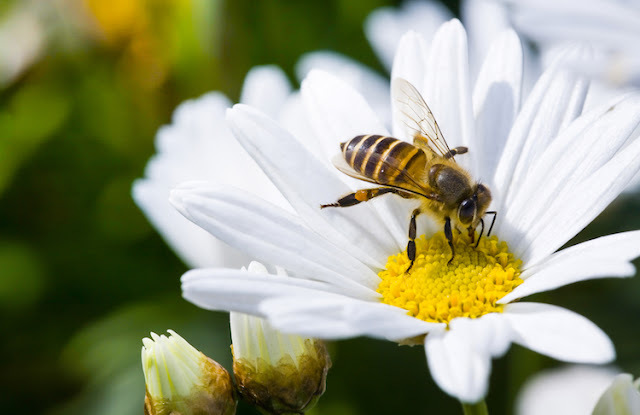 Whether you want to learn about the factors affecting honey bee health, how honey bees help feed our communities or the difference between honey bees, wasps and hornets, you are already taking a crucial step by showing an interest in pollinators and their crucial role in Canadian agriculture. Visit beesmatter.ca. This website is one of several initiatives to work together with beekeepers, scientists, environmentalists and everyday Canadians to improve honey bee health and shed light on the many factors affecting honey bee health. Here you will find information about honey bees in Canada and how you participate in the Buzzing Gardens program. Be sure to bookmark this site for ease of reference. Plant a pollinator-friendly garden. If you haven't already, sign up for the Buzzing Gardens program by visiting beesmatter.ca and they will send out a free seed packet per household while supplies last. If you have already received your seeds, it's time to pull out your gardening gear and start planting. Get your kids involved, too! Add a bee bath to your garden. Because bees get thirsty, too! All you need is a shallow plate, a few rocks, and some fresh water. I used a plant pot tray and added a bunch of small rocks. The rocks serve as a landing pad. Plus, it makes for a pretty garden feature as well. Share the Honey Bee Learning Centre. If you have school-age children, let their teachers know about the Teacher Toolkits and other learning resources they can use throughout the year within their classrooms. There are several lesson plans for grades 1 to 4 that have been designed with various Canadian curriculum in mind, complete with reproducible blackline masters. Pay a visit to a local farmer and/or a botanical garden. What better way to learn about the importance of pollinators than to speak directly with a farmer. You can also stop by a botanical garden to speak to experts on gardening and local plant life and to inquire about additional learning opportunities. For example, the Toronto Botanical Garden hosted a series of workshops on City Critters where the kids and I learned all about the various roles of honey bees and sampled different types of honey. We were also fortunate to participate in another session where learned about butterflies, planted a butterfly garden and released dozens of beautiful Monarch butterflies into the wild. Disclosure: I am participating in the Bees Matter blogger campaign and have received special perks. Any opinions expressed in this post are my own. Although I never heard of a bee bath before, I'm going to add one to my front garden where we planted our free bee seeds. I hadn't until I read up on pollinator-friendly gardens. They are so easy to make, too! such a fun read - my name in Greek means Honey Bee ! I am definitely going to make a bee bath. I never thought of that but it makes perfect sense that bees need water. I never heard of a bee bath,how interesting is that thanks for sharing ! I was so glad this summer that I saw bees in my flowers. I have not thought about a bee bath. Those are great suggestions for educational things to do!